By the title, I mean the World of Althéa of course and not ours, unfortunately. ;) How did I get into this and end up avoiding plot writing again you may ask? It was as I was working on the first conversations where a player can try to start to get different equipment for their PCs when I was reminded of the horrible economic values placed on items in NWN universe. Some may not mind seeing figures run into the hundreds and thousands of gold pieces, but I find the figures somewhat distasteful. For those who may have played PnP (pen and paper) D&D, the idea of having a shop full of magic items was never heard of, and the best the player could hope for was the chance of buying scrolls and potions, or possibly a few very low magic items like arrows and bolts if they happened to be in the right place at the right time. In NWN, however, it is not uncommon to see in a store a plethora of magic items starting from a few hundred and run into the many hundreds of thousands of gold. Wheel in my cart-load of gold as I want the set of plus five swords third row from the left please. ;) Now, I know this has been done to simply help the running of a world where a certain balance must be maintained while still offering the player choices, but I sill cannot swallow the idea for my own world, and is why I have been altering many of the cost elements within the game. And even then, limiting the stores to minor magic items only. From experimentation, I have found that altering the baseitems, iprp_meleecost, iprp_skillcost (and yet to be tested iprp_feats) 2da files appears to do what I hoped for by reducing the costs of items considerably. Of course, this then adds the problem of ensuring balance is maintained for players who wish to craft items (hopefully a little cheaper) and potentially even selling them to make a little gold. To this end, I have had to go through nearly every item that can be crafted to see if its final base price is not too high compared to other items and manually edit every item where needed. It is a very boring job and I still have a way to go. :( But, at the end of things, I hope the economy structure will look a lot less "unrealistic" and more in line with old PnP style gaming than the amazing rich world of the CRPG. Another aspect of this is that I want the player to be encouraged to craft (and enchant) their own items as much as possible. As I have said before, items will be available to purchase, but part of becoming a successful adventurer in the world will be to acquire rarer materials and craft items for themselves. Darn I was hoping for a political conspiracy post :( I'm saddened. Haha, this looks interesting! 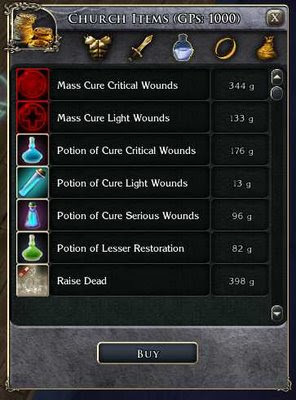 I can see why computer games sell a bunch of magical items, even if it does destroy some realism. But if realism is one of the things you're shooting for, then this system will definitely help add to the feel of the module. Just make sure its not so bad, you'll scare away the players though. Since you aim for a "realistic" economy, have you considered using the Pencil n Paper Coins from the vault? It's a bit silly when the poor farmer gives you 50 gold coins as a reward for killing the vermin of his farm. I know what you mean about not going too real. :) I mean, I don't want to turn an excitng adventure into a copy of a day at work, do I? Hopefully, I will get the balance right. I am aiming somwhere between "Middle Earth" and "Middle Ages" feel. I did seriously consider the PnP coins and even downloaded it to take a look a while back. However, I am not yet convinced that I will need to go quite to that level of detail. I haven't ruled it out, but to include it would mean even more item cost alteration. I also looked at it this way: I am considering that the gp will be the equivilent to around £1 and that most items will be a minimal charge of £1 (with items like food being something they grow and eat from the land themselves mostly). The "peasant" (or the basic local NPC) will still earn around 10 - 20 gp a month. Moderate earners will earn around 20 - 40 gp a month and high earners around 40 - 60 gp per month. Classes beyond this, like royalty, nobility/shop keepers and adventurers potentially have a great deal more at their disposal if their estate/business or adventures are in good health and/or are rewarding. There are obviously some small anomolies when only having a single coin system, but as the adventurer (player) is unlikely to deal in coins smaller than gold within a few adventures time, then I doubt it will have much bearing to the player in the end. However, it may appear more understandable now if the same farmer in your example only offers around 5gp (for a skilled job) for one day's work of destroying said vermin. By comparison, the farmer (depending on the size of their farm and final income) has offered the equivilent to 1-3 days pay to someone of an equivilent skill to their own - but different. Now, 5 gp may not sound a lot of a reward, but it sounds better than 50 gp without resorting to rewarding copper or silver. "This is important because gold does weigh something in Althéa! Therefore, if you are playing a weak character, you may even consider a strong companion simply to help carry the treasure found. :)"
I am addicted to loot and I spend hours on inventory management because I want to keep it all - and neatly stored in the backpack! That is also one of the reasons I generally play STR based characters! Shiny plates and pleanty of gear to swap! The first 500gp I allow the PC to carry without any encumbrance. After that, 500 gp weighs 10 lbs as per D&D rules. This sounds interesting. I always found the number and power of magic items kicking around stores to be a bit much. I tend to think that magical/powerful items either should be found or crafted. Good luck wrapping this up so you can get back to the plot work. Yes, that is my sentiment exactly regarding magic items. :) As I say, I don't mind the odd minor one, but access to many always felt "wrong" somehow to me. It robbed the player of the experience of finding (or finding the elements to craft) somthing extraordinary for themselves. I am also considering making a small seperate GUI to work alongside the store with the extra information about the store (for an at-a-glance shop info like gold resources, max pay price, id price, etc.) After all, the player would normally try to negotiate such information from the store keeper to work out where the best deals can be made.